When plaque begins to build above and below the gum line, you may notice your gums become red, puffy, and irritated. They may even bleed when you brush or floss your teeth. 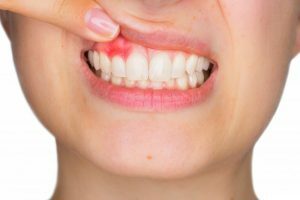 This is what is called gingivitis, and if it’s caught in its early stages, there is a good chance you can reverse the symptoms and get your oral health back on track. However, if the plaque and bacteria continue to grow, it can lead to a more advanced form of gum disease known as periodontitis. This can cause irreversible bone loss and ultimately, tooth extraction to prevent further infection. You know it’s gingivitis, and you know you should call and schedule an appointment with your family dentist in Norwood. Since you don’t want the gum disease to worsen, here are some ways to alleviate some of the symptoms in the meantime. Be strict with your brushing. For bacteria to be removed, you’ll need to brush for two minutes, twice a day. Electric toothbrushes are great at providing a more thorough cleaning, but remember to not only brush your teeth but your gums as well. This is where plaque can build and cause problems for your mouth. Also, holding your brush at a 45-degree angle and using a short, circular motion is the most effective way to clean your gums. Remember to never brush too hard, as you can damage the soft tissue. Don’t forget to floss. Brushing your teeth isn’t enough to keep your mouth clean. You need to floss, so you can get between your teeth to remove any debris and bacteria living in the crevices. It’s important to floss at least once a day. Use antibacterial toothpaste and mouthwash. To ensure the plaque stays away, antibacterial toothpaste and mouthwash is a great option. Mouthwash can reach places that flossing and brushing cannot, and even anti-gingivitis toothpaste can fight off plaque living in and around the gum line. Stop gingivitis in its tracks. By following some of the tips mentioned, you can keep your symptoms from worsening, and after seeing your dentist, you’ll be able to walk out of your appointment with a cleaner, healthier smile. Dr. John T. Michaels, DDS, has completed over 1,000 hours of advanced education in dentistry, including cosmetics, implants, endodontics, periodontics, and orthodontics. He and the staff at Norwood Dental Care provide state-of-the-art service in a friendly and comfortable environment. Using the latest dental concepts and technologies, our expert team are dedicated to improving your oral health. For questions about our services, visit our website or call (781) 769-6140.